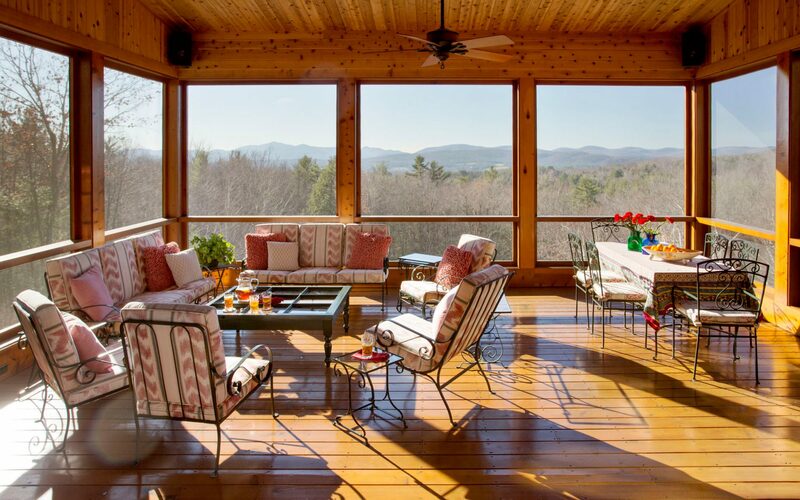 After an unsuccessful search for an old Vermont farmhouse to restore, this family found a 47-acre mountain-side property with breathtaking views to build the home of their dreams. The goal — to create a spacious, light-filled home that “feels and looks like it’s always been there,” says Elizabeth Swartz, ASID, a Boston interior designer. We invite you to step inside and see how we re-defined ‘Vermont farmhouse’ to fit the needs of this family. 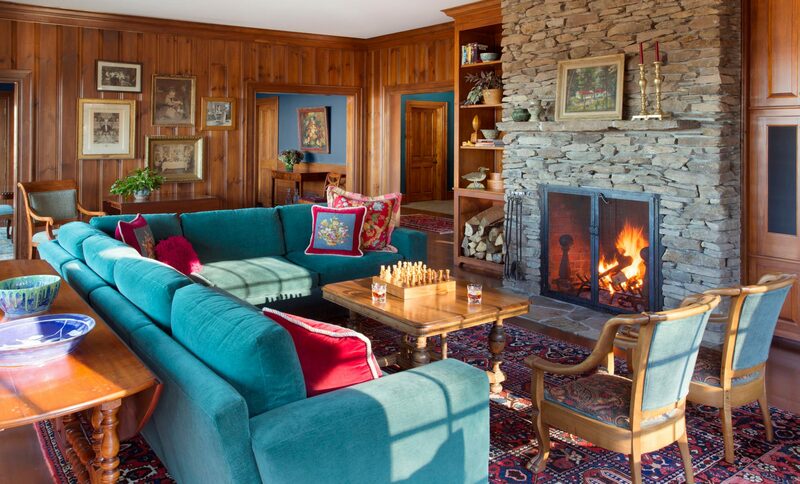 From interior design details to architectural layout we worked to create the spaces envisioned for this Vermont home. Our team set out to design a custom built home that blends rustic Vermont character with the family’s style, love of color, vintage furniture and rich fabrics. This family of four was relocating from a more formal Colonial home in New York. 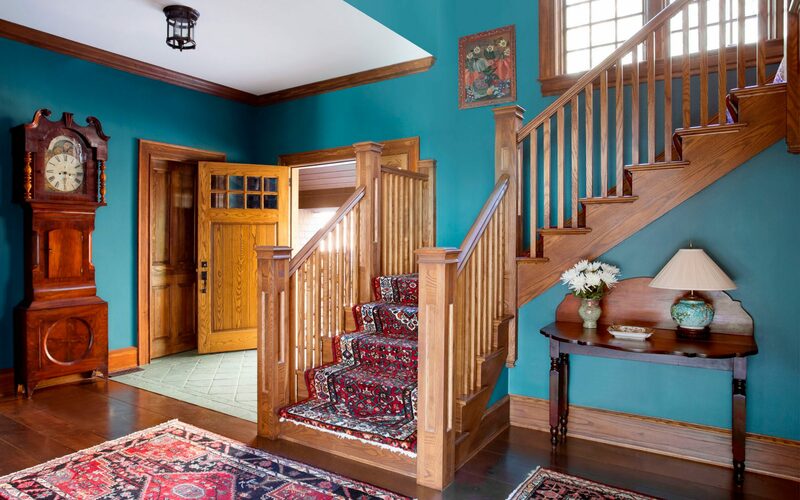 In the foyer the jewel-toned color scheme of teal and reds sets the stage. Stained woods, which serve as an extension of the rustic wooded landscape, complement the bold colors. Natural stained woods carry from one room to the next. Including the spacious living room, where floor-to-ceiling knotty pine paneling adds a warm and rustic feeling to the walls. The living room’s focal point is a fieldstone fireplace, which adds to the rustic feeling while traditional furnishings finish the space. By choosing Pella casement windows with divided muntins, rather than a more contemporary floor-to-ceiling glass, we retained historical authenticity. At the same time, this allows for lots of natural light. We designed a bold, solid oversized sectional sofa for comfort and then balanced this contemporary style with more formal patterns in the large area rug, window treatments and upholstery. This family loves to cook and entertain. 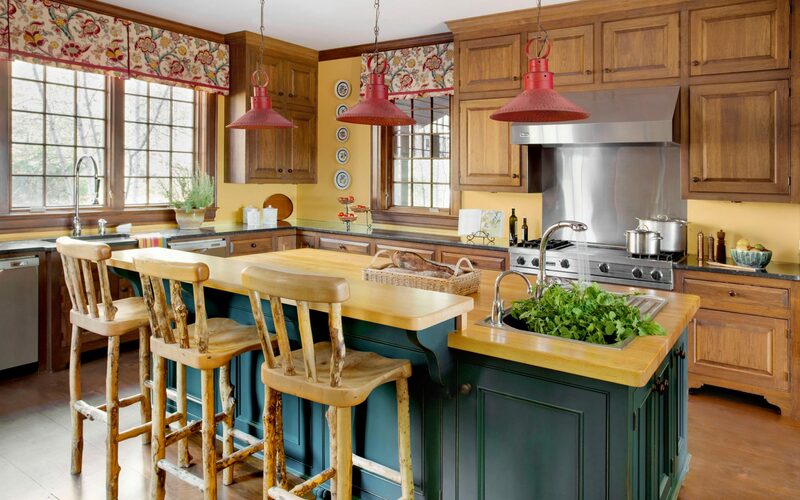 So the first floor interior design by Elizabeth Swartz Interiors includes ample space for kitchen and dining areas instead of a small country kitchen traditionally found in an old farmhouse. The teal color scheme in use throughout the home is also in use on the kitchen island. This large island in the center of the room affords plenty of space for prepping meals. 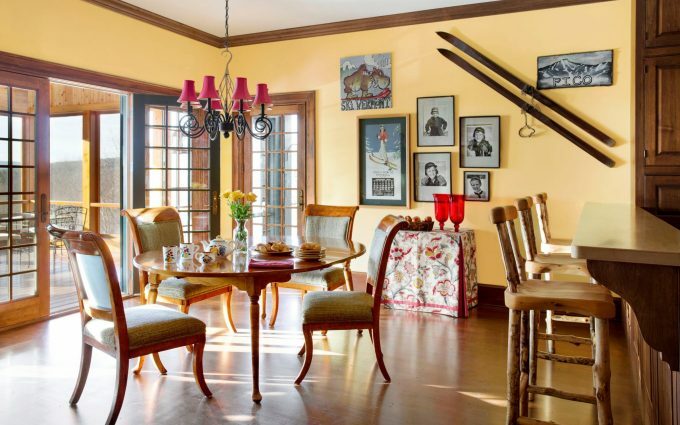 Rustic pierced-tin lighting fixtures hang above the island, offering an accent of red against the warm and sunny yellow walls. The barstools are handmade, with thick maple seats and twig detailing, again adding to the Vermont rustic flavor of the space. 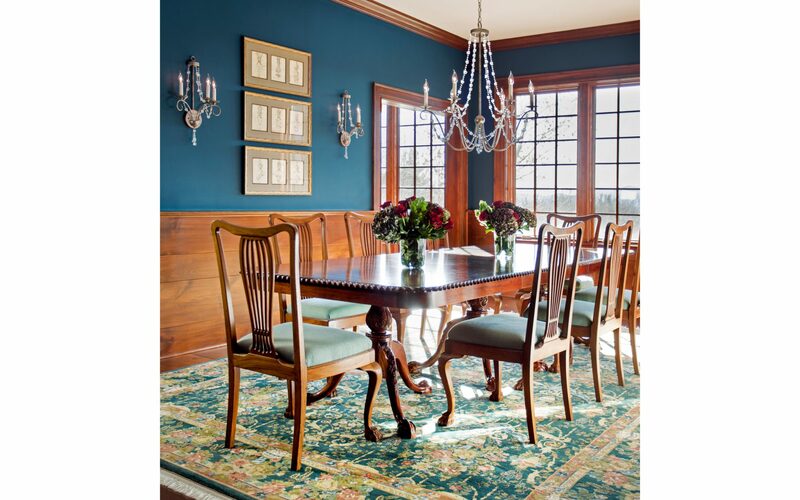 In the dining room jewel-tones of teal, green and blue continue from the other spaces. A formal mahogany dining table anchors the space. The chandelier is “lightly gilded, so it brings a bit of pizzazz to the room – but not too much,” interior designer Elizabeth Swartz, ASID explains. The sense of authenticity in this Vermont home didn’t stop at interior design details. Elizabeth Swartz Interiors carefully worked to ensure the architecture of the house met the same design goals. We took inspiration from late 1800’s shingle-style homes in New England with multiple gables as well as shed dormers and bay windows. 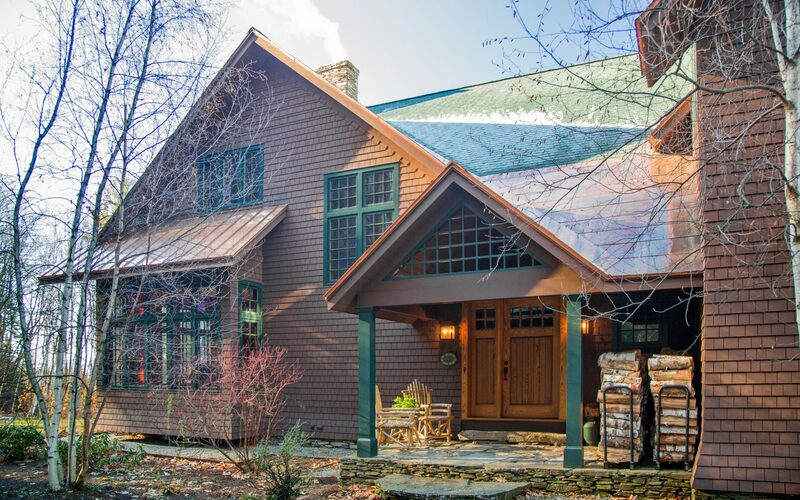 The dark green trim complements the standing seam copper metal roof and the dark stained shingle siding that flares over the fieldstone foundation. Inside on the upper level, the pitched ceilings add a sense of architectural interest to the space, and reflect the architectural details on the exterior. 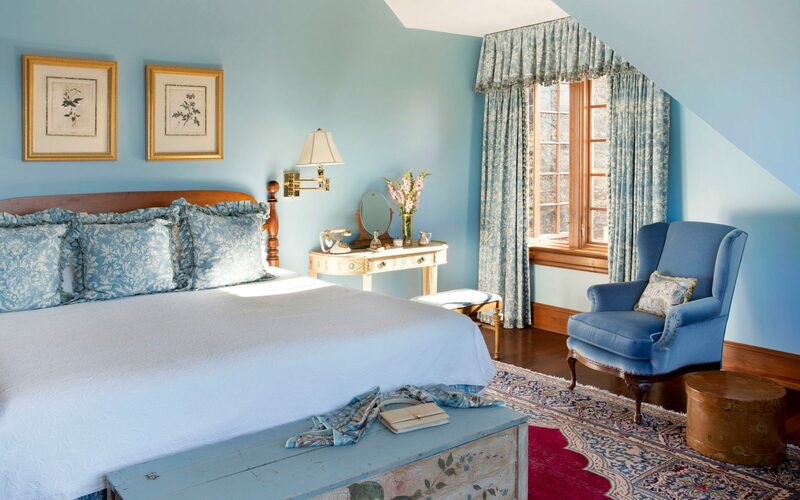 Historical blues complement the warm woods on the floor, doors, windows and trim. Elizabeth Swartz Interiors worked with local craftspeople to ensure the authenticity of each space. In addition, we thoughtfully selected native Vermont finishes for the details that make the difference throughout the home. 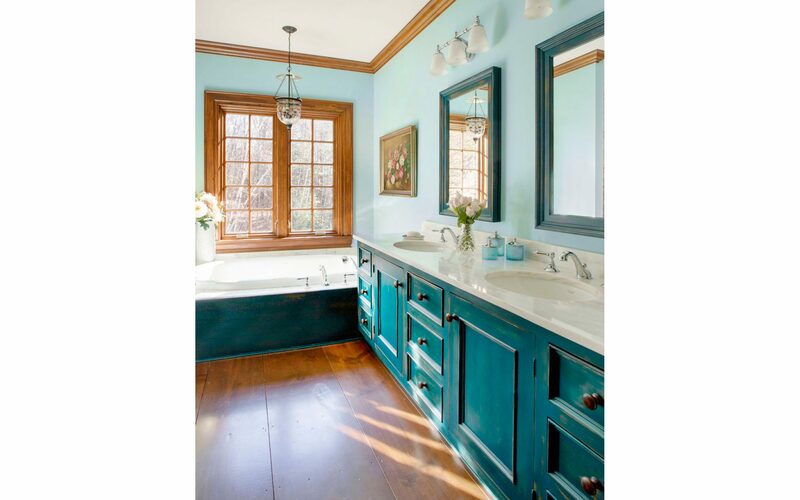 The master bath continues the teal color-scheme from the lower level with a distressed custom vanity cabinet. The countertop is Danby white marble from Vermont. 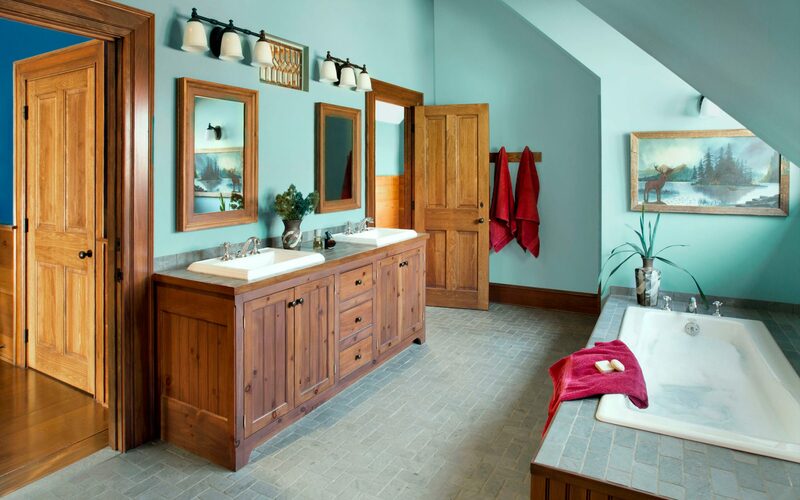 The flooring in several of the bathrooms is Vermont slate. It is also carried onto the tub and sink surround of this jack-and-jill style bathroom. 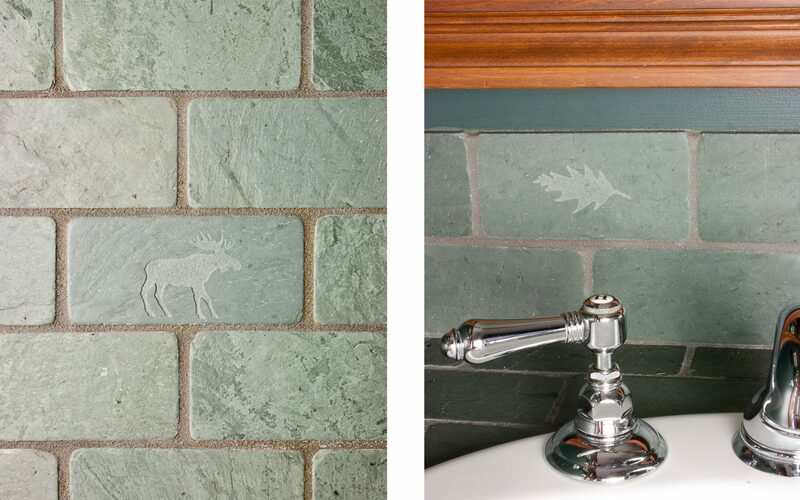 In a nod to the rustic mountain setting, Vermont details such as moose and native leaves are sandblasted into a few of the slate wall tiles. 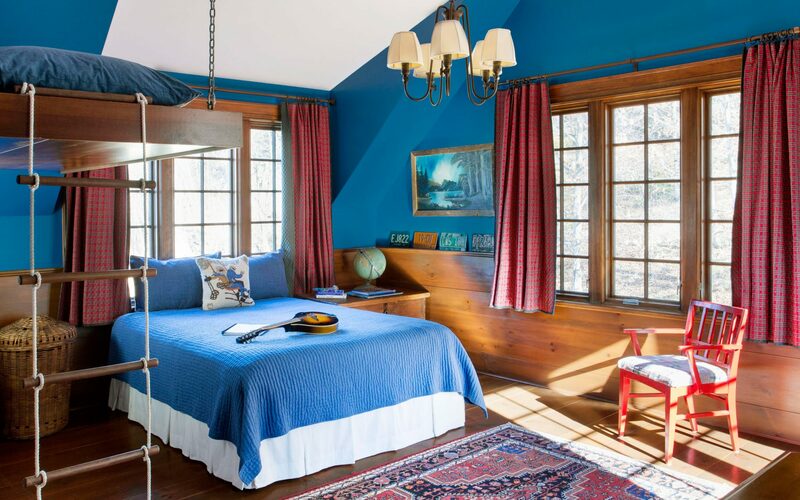 The re-defined rustic design continues in the boy’s room with horizontal knotty pine wainscoting contrasting the bold blue walls. Playfully tucked into the corner, under the eaves is a hanging loft, accessible by a rope ladder. The dilemma of renovating versus building can be tricky. Especially if you don’t find the perfect property to transform into the house of your dreams. With every detail thoughtfully planned, Elizabeth Swartz Interiors was able to create this family’s dream Vermont farmhouse. Are you imagining the house of your dreams but unsure of where to start? Be in touch and we can help you and your family through every step of the design process. Elizabeth, I enjoyed reading and looking at your project. Fun colors and great spaces. I liked your comment about staring with a rug that anchors the space.